The Second World War saw many evacuated to Bideford, whilst in East-the-Water the Home Guard began to plan for the possible German invasion. They decided where to site their roadblocks and they set up a hidden depot at Cleave Mine that could support covert resistance should that be needed. Quite early on, there was an outbreak of diphtheria in the town, with those infected conveyed to the local isolation hospital. This stood “just outside Sentry Corner.” Old maps show the hospital on the site that is now occupied by Broomhayes, a complex more recently used by the National Autistic Society. In the 1940 evacuation from Dunkirk HMS Bideford lost much of her stern. This ship, one of several to have born the town’s name, had been launched in 1931 at Devonport, however, at Dunkirk, it was the heroic towing of the gunboat HMS Locust that ensured she sailed another day. 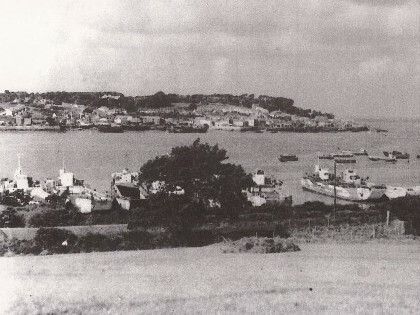 June 1943 saw Bideford Bay pretending to be Normandy (which it quite resembled) for rehearsing the D-day landings. By that time so many American service-men were in the area that an American Red Cross club was opened for them near Chudleigh Fort. Old cine footage has come to light showing Churchill and Eisenhower visiting the area to view the preparations. In 1945 a Royal Canadian Airforce Wellington bomber, “P” Peter, flying from Chivenor, suffered engine failure and crashed in a field near Round Hill (south of the community). Colliding with a stone hedge in the process, half its crew of six were killed and one airman was seriously injured. A simple monument stands beside the Tarka Trail to recall the event. Bideford’s eastern shipyards had been more focused on non-military shipping than the Cleave Houses yard, so it was unusual to find an East-the-Water built boat with a fully military function. One such was the George L. Muir (a ship of 64 tons built by Restarick’s yard as Cholmondeley). She was converted to serve as one of the ‘Q’ ships, armed decoy vessels used to entrap enemy submarines.